Usually after we visit a city we like to write a nice summary post about where we stayed, what we did and where we ate. We’d still like to discuss some of these things with regards to Kathmandu, but it feels weird to talk about the city without mentioning that just a few days after our visit a 7.8 magnitude earthquake hit and did a lot of damage in the city and the country as a whole. So we’ll try to balance our discussion of our time in Kathmandu with what we know of what happened to the sights after the quake. We arrived in Kathmandu late on the evening of April 20, on a Dragonair flight from Hong Kong. (We really enjoyed using the personal entertainment device on the flight and were able to watch Into the Woods and four episodes of Downton Abbey). This was only a preview of the generosity that the owner showed us during our three days in Kathmandu. He provided plenty of good advice, and walked us halfway to the tourist office (so we wouldn’t get lost) to pick up our trekking permits. That made it that much harder to see him again after the quake. We had left two bags at the hotel while trekking, and we went back into town on May 1 to pick them up. He said on the phone that he and his family were ok, but when we got there it was clear how close they had come to disaster. 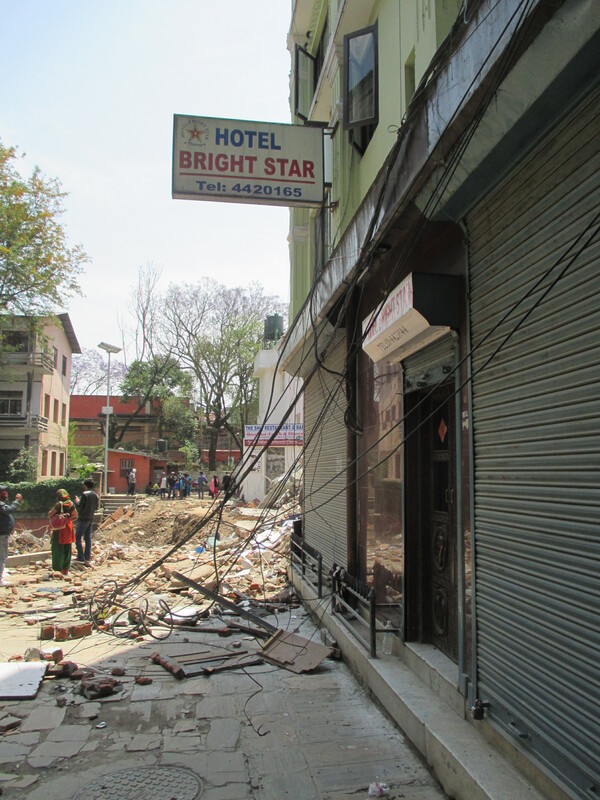 The hotel next door had collapsed during the quake, and all that was left was a pile of bricks and tangled wires. The owner, clearly shaken, told us that 10 people had died inside. We ran inside our hotel to get our bags, and it was clear that it was the first time that he had been back in. He didn’t want to linger, and neither did we; one of the walls of the lobby on the side of the collapsed building was bulging inwards. On our first day in Kathmandu we did a self-guided walking tour (led by Lonely Planet) through the old part of Kathmandu. We quickly decided that Nepal was way different from any other country that we had visited on the entire trip! Bright colors all over the place, smells both good and bad in the air, people hawking items, bicycle rickshaws asking for rides, centuries-old temples in every nook and cranny… it was almost overwhelming! 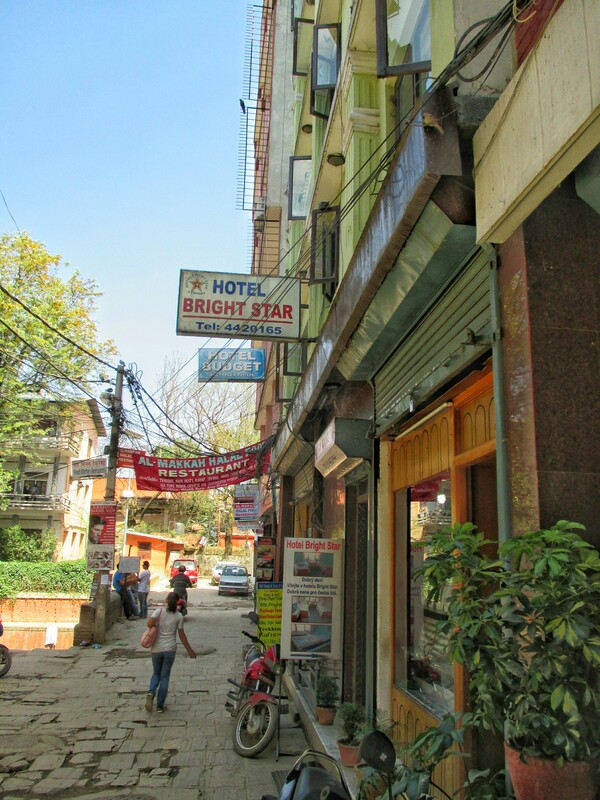 After the quake, we only ventured back to the more touristy part of the Old Quarter, called Thamel. There wasn’t much physical destruction, but the change in the atmosphere of the streets was palpable. Half of the shops were closed up, and the foot and vehicle traffic was maybe half of what it once was. The sense of calm as compared to before was eerie. 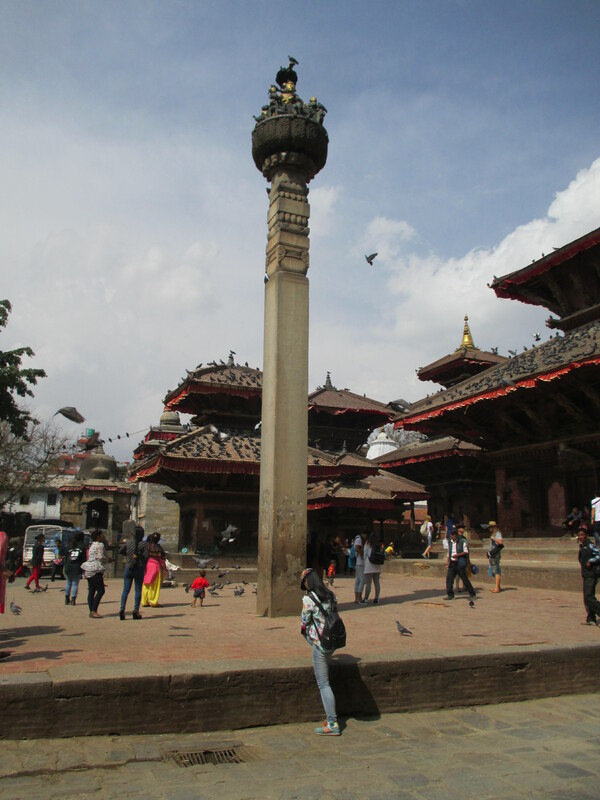 The main historic attraction in Kathmandu is the UNESCO World Heritage-listed Durbar Square, a collection of temples and palaces that was one the home of the Nepali royalty. We spent a whole afternoon exploring the different sights. 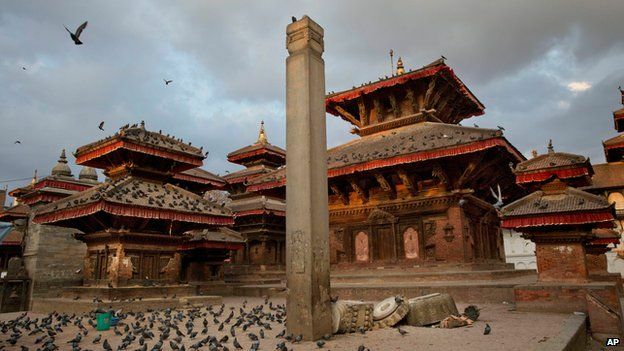 The earthquake did a great amount of damage to Durbar Square. We didn’t make it back to see for ourselves, but the pictures we have found online show the devastation. 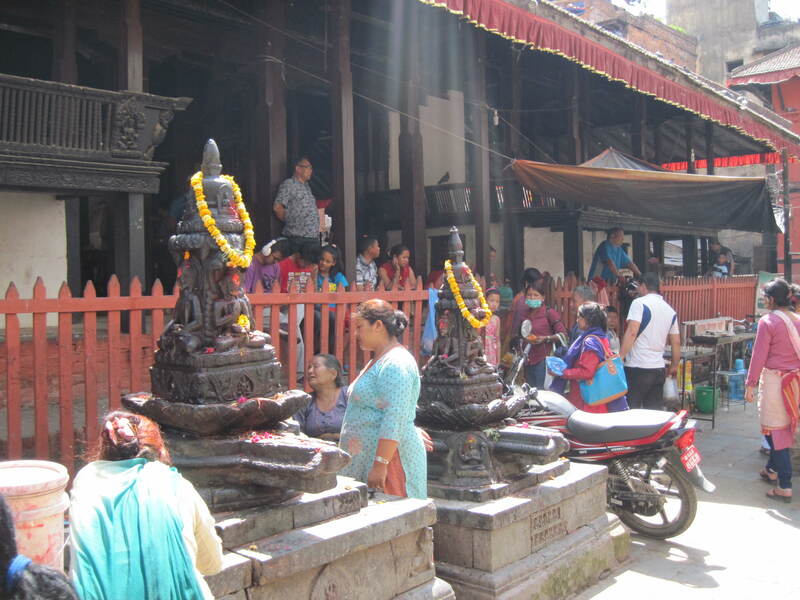 This temple, built in the 12th century, is what gave Kathmandu its name. To us it felt a little bit more like a pavilion, with a large awning sheltering an open space with a few shrines. 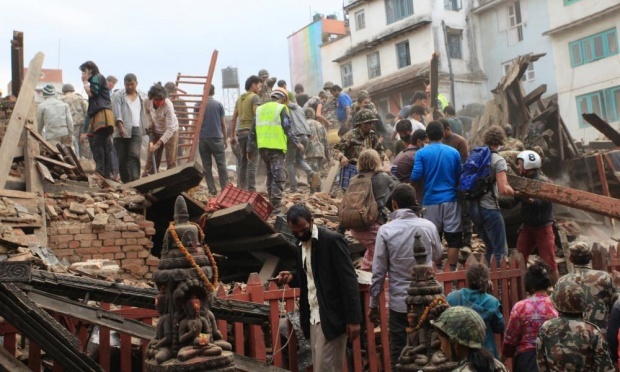 From news reports, it appears that Kasthamandap has been completely destroyed. Not our picture – photo source http://www.theguardian.com/world/2015/apr/27/nepal-earthquake-destroys-kathmandu-valleys-architecture-buildings-heritage. Note the same two statues as in our before picture. This tall Hindu temple dominated the center of Durbar Square. We joined the crowds of locals at the top and used it as a nice platform to rest our legs and watch the buzz of activity in the square. The Maju Deval was completely destroyed in the earthquake, and only the platform remains. Near the entrance to the square’s museum was a small area with more temples and a large column with a statue on the top. The statue is a representation of the famous Nepali king from the 17th century. During the earthquake, the statue fell off its pedestal, but it appears that the surrounding temples are standing. In the center of the Durbar Square area is the Hanuman Dhoka complex, which contains the buildings that make up the Royal Palace. We visited the museum here, which was a collection of dusty artifacts from the last kings of Nepal (before the monarchy was dissolved). Inside the complex were a few nice courtyards. 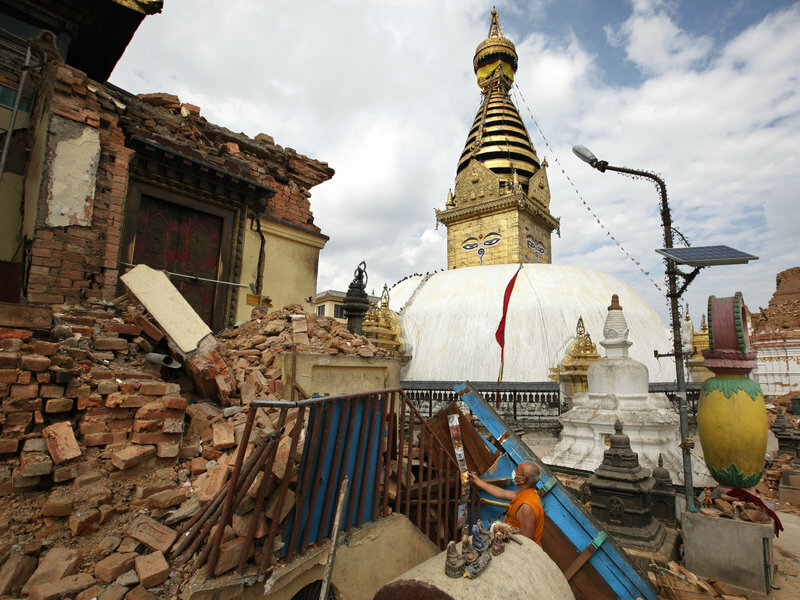 Swayambhunath was damaged during the earthquake. The large stupa itself looks ok, but many of the buildings surrounding are in ruins. As in Myanmar, part of the fun of visiting Nepal was retracing the steps of Della’s parents on their round-the-world trip. 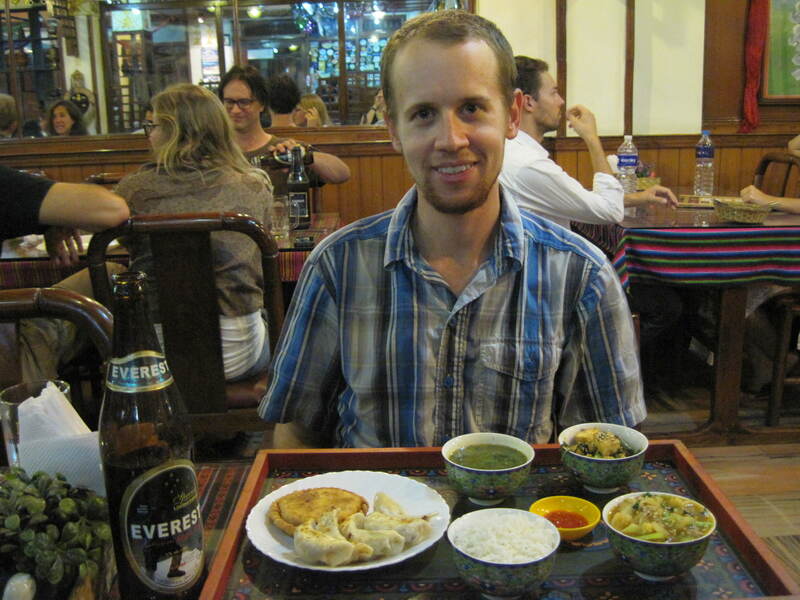 Their favorite restaurant in Kathmandu was Utse’s, a Tibetan restaurant. We were happy to see that it was still there and was even in the Lonely Planet. We went there for dinner and enjoyed our Tibetan meal. We went back to check on it after the quake; the building seemed intact but they were not yet open for business. Another dining highlight was a bit of a splurge for us. We had a nice dinner at the Thamel House, located in a charming old building. What drew us here was the free dance show that went on throughout our meal. This time we got a Newari set meal, and got to sample local specialties such as dal bhat and other curries. When we walked by after the quake, it seemed like the building was in good shape and they were re-opened already. If you had asked us before the earthquake, we probably would have said that we found Kathmandu to be a bit dusty, crowded and chaotic, but at the same time a fascinating place to explore years of history and an intriguing culture. But now with the damage that the quake did to some of the sights we saw, we just hope that this city can recover and rebuild to allow others to see and experience this treasure for themselves. Good Preview -much denser and larger than when we were there. And no mention of the “pie shops” which were the big thing then -and which served –yes western style fruit/ berry pies. Student council did a fund raising event at PBA to collect money for Nepal. I think we should do one every Friday to keep collecting money to this cause. Thanks for your story! What a great idea! Do you know which charity they are fundraising for? Amazing to see those before and after pictures you shared. It is such a sad story but I think there are lots of people and countries who are willing to help. It will take time but it will rebuild and be successful. Hopefully one day more people will get to experience what you did. Thank you for sharing. Oh and we will find out next week how much the school made for our fundraising event. Thanks for your kind comment! I’m so glad that school is working hard to help support Nepal!